Dr. Williams’s research area is particle astrophysics, the study of fundamental particle physics and astrophysics using measurements of signals coming from outside the solar system as well as through earth-based experiments searching for dark matter and the origin of dark energy. Dr. Williams’s group is developing techniques to identify tau neutrinos detected with the IceCube experiment, which is the largest neutrino detector on Earth. Located at the geographic South Pole, IceCube consists of strings of photomultiplier tubes deployed between 1500 and 2500 meters deep in the Antarctic icecap. IceCube completed construction in 2010 and consists of 86 strings instrumenting a cubic kilometer of ice. IceCube was built to detect astrophysical neutrinos at TeV-PeV energies from objects such as active galactic nuclei and gamma ray bursts, which are believed to be the source of the highest-energy cosmic rays. Dr. Williams received her doctoral degree from UCLA in 2004. 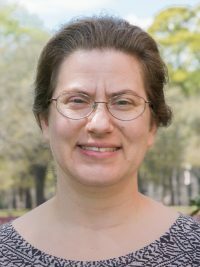 She joined the faculty of The University of Alabama in 2008.